Golden State remains unbeaten this postseason, rolling to a 132-113 win. 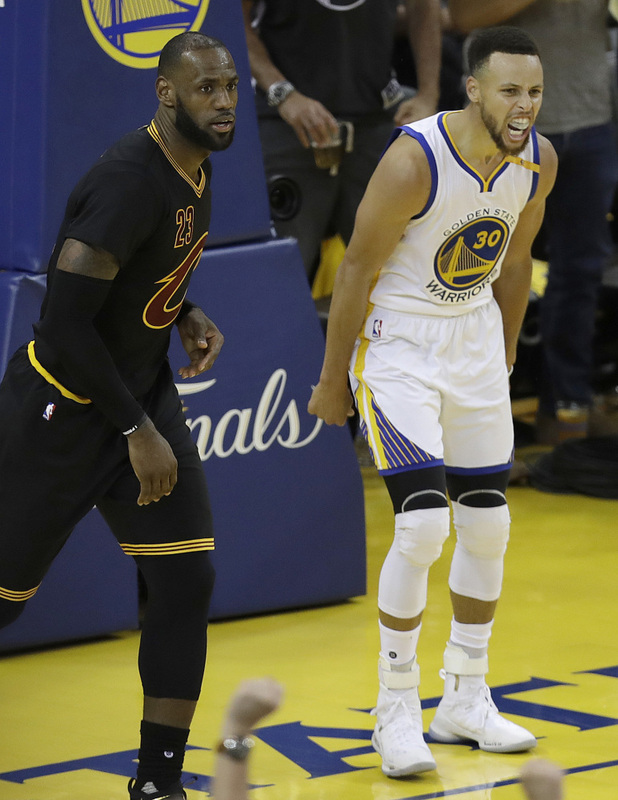 OAKLAND, Calif. — Stephen Curry dribbled every which way and beat LeBron James to the rim in a move reminiscent of his recent MVP magic, and the Golden State Warriors grabbed a 2-0 lead in the NBA finals by downing the Cleveland Cavaliers 132-113 Sunday night in Coach Steve Kerr’s return to the sideline after a six-week absence. 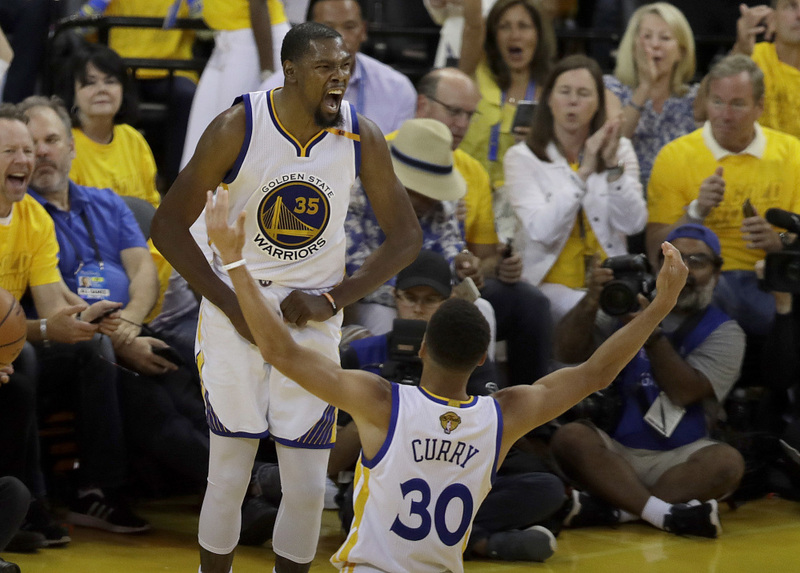 With the NBA Coach of the Year back on the bench at last, Curry and Kevin Durant tag-teamed the Warriors to within two victories of another championship. Curry recorded his first postseason triple-double with 32 points, 11 assists and 10 rebounds, while Durant contributed 33 points, 13 rebounds and six assists. 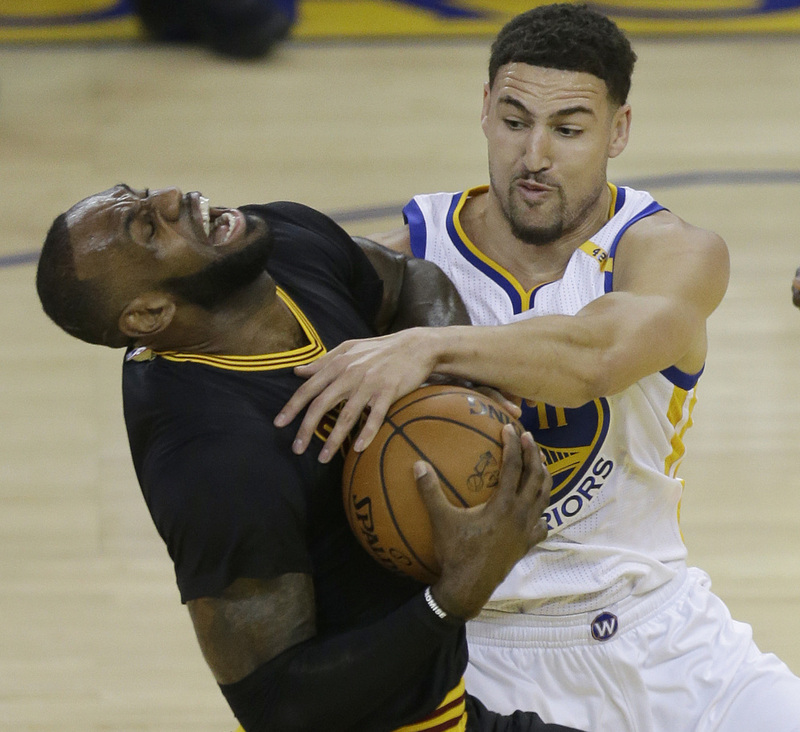 Associated Press/Ben Margot Klay Thompson fouls Cleveland's LeBron James, who did his best to give the Cavaliers a chance by recording a triple-double, but Cleveland returns home in a 2-0 hole. James was equally spectacular with his own triple-double of 29 points, 14 assists and 11 rebounds, but yet again didn’t get nearly enough help to keep up with Golden State’s depth despite Kevin Love’s 27 points and Kyrie Irving’s 19. Klay Thompson emerged from a postseason-long shooting funk to score 22 points with four 3-pointers while playing more stellar defense and pulling down seven rebounds for the Warriors, who shot 18 of 43 from deep. “We turned the ball over too much in the first half. But the second half, I think we settled in, tried to play simple, and defensively just tried to contest their shots,” Durant said. The best-of-seven series now shifts to Cleveland for two games, with Game 3 on Wednesday. Curry provided the coach more than a glimpse of his greatness from up close. He ran circles around James during one masterfully skillful sequence, then drove left through the paint for a right-handed layup over the star’s outstretched arm during a signature moment in another rout. Curry wore his emotions for everybody to see, willing the unblemished Warriors to maintain control even when Cleveland went on a third-quarter run after that play. Durant scored from every corner of the court. He flicked the ball up while falling backward and being fouled by Love and got a lucky bounce for a three-point play 7:04 before halftime, just after Love had hit a 3 on the other end.